Combine flour, cake flour, baking powder, and baking soda and set aside. Combine butter and sugars in mixer at medium speed until well mixed. Add eggs and vanilla. On low speed, add flour mixture and chocolate chips. 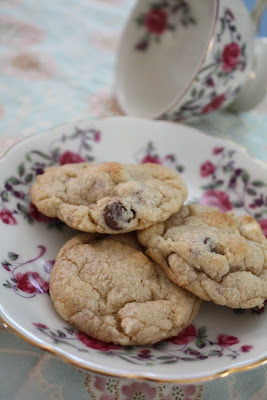 Drop by tablespoonfuls onto ungreased cookie sheet.